I drive past this tree in my neighborhood every day. Am I the only one who finds this sight very unsettling? One good [bad] gust of wind and down that poor thing will come. Talk about lopsided. Scary! Call the arborist, stat! Hi Wendy! I've been anxiously waiting for my garden to start producing so that I can join your garden to table challenge! That picture is very disconcerting. I guess we should be thankful they didn't cut the tree down. Hopefully it will survive the bad haircut, but it sure looks like it wants to topple over! I would too if someone cut my hair like that!! I would never park my car near that. Did someone cut it like that to keep it from growing into the power lines? Stupid. Oh my, that's some tree. Guess someone wanted it to live. Let's see... you could print the picture, take scissors and cut it from the base of the trunk to the tip top of the tree, discard the right hand side, and hold the left side 90 degrees from the face of a mirror. That should show you what the tree would look like if it had been left undisturbed. You could take a picture of that. I know that's a stretch, but it would make for an interesting comparison of before and after since the tree is so straight. Wow. Very unsettling. I hate to see a tree come down on any occasion, but I think removal might be the best course of action here. That just doesn't look safe! Oh my god! That's really unsettling photo! 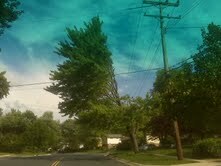 Hope the tree survive the wind! I just reported this tree (sorry tree) to the city. It has been leaning more and more each day. About 10-15 kids (including mine!) stand here every day waiting for the bus! Last week, the rainstorm wreck a havoc here. Many trees were uprooted. I hope that tree has strong roots. Take care. Looks like a hurricane in progress. Kombucha - shock value or health value?